The dog-friendly Beck Hall Hotel & Bistro in Malham competed to be crowned ‘best value establishment’ in Channel 4’s popular TV show Four in a Bed, aired on November 2-6 2015. The programme sees four sets of hoteliers take turns to stay at each other’s properties and pay what they think is fair for their stay. Beck Hall owners, Louise and Andy Macbeth, went head to head with the proprietors of the Kings Head in Lincoln; Torquay B&B The Albaston and the dance-themed Hotel Piccadilly in Bournemouth. The visit to Beck Hall, aired on Tuesday November 3, showcased its beautiful stream-side location, newly-renovated rooms, bistro and snug, and included a spot of trout fishing at Kilnsey Park in Skipton. However, not all competitors appreciated Beck Hall’s dog-friendly approach. “We suspected we might be paired with some people who dislike having dogs around and that turned out to be the case,” explained Louise. 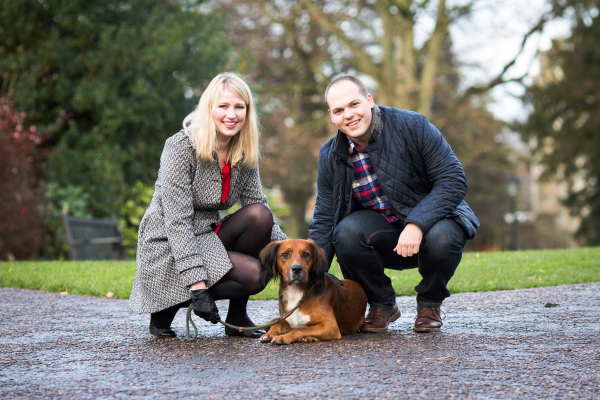 “But as dog owners, we’ve always wanted to create a little hotel and bistro that is truly dog friendly, not just ‘dog tolerant’ as so many turn out to be. Malham has some of Britain’s most magnificent countryside – it’s walkies heaven – and the concept has been hugely popular among our guests,” she added. Since the show, dog lovers and fans of the countryside have rallied support for Beck Hall. One Facebook user wrote: “We wouldn’t stay anywhere without our pooch and have stayed in some fabulous places so don’t let them put you off”! “The response we’ve had has been overwhelming and so unexpected,” said Andy. With more than £16,000 of bookings, the couple, who took over the hotel in July last year, plan to renovate eight more rooms over the winter. “We applied to appear on the show in the hope it would gain us some publicity and it’s far exceeded our expectations,” added Louise.